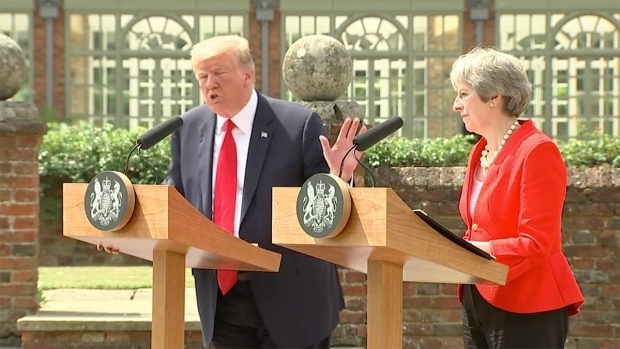 Trump had accused Prime Minister May of ruining what her country stands to gain from its Brexit vote to leave the E.U. President Donald Trump closed out a turbulent 30-hour visit to England on Friday that featured massive protests, moments of pageantry and startling diplomatic backflips as the U.S. leader tried to smooth over controversies on trade, Brexit and his critical assessment of British Prime Minister Theresa May. Up to 100,000 people massed in London for demonstrations against the president's visit. 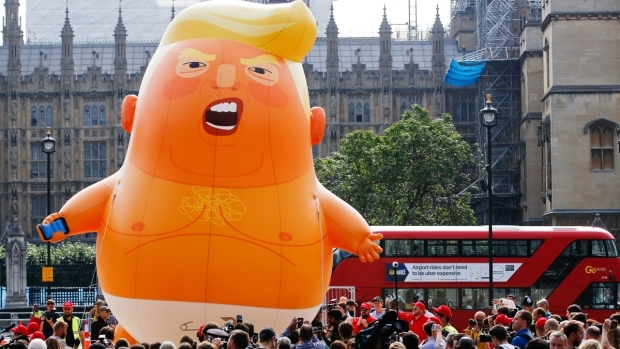 Marchers gathered in central London before walking through the center of the city to Parliament — where earlier the 20-foot (six meter) baby blimp hovered overhead. Many protesters used humor to convey their opposition. One sign read "Trump wears poorly tailored suits," another proclaimed "Overcomb Brexit." One man was selling rolls of "Trump toilet paper" emblazoned with a picture of the president.